Ian Baird's Spitfires travel away to Chippenham Town at Hardenhuish Park in the FA Trophy tomorrow (3pm kick off) in the Third Qualifying Round. Not only will the winners be in the First Round draw for FA Trophy, they will also win £4000 for progressing to the next round. 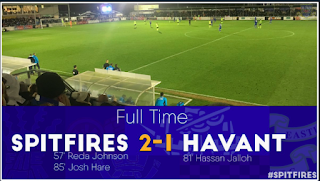 The Spitfires have been in good form lately having won three of their last four games in the league and drawing against fourth-placed Dartford last Saturday 2-2 at the Silverlake Stadium. Chippenham are doing well in the Evo-Stik Southern League - they are sitting in seventh place and have won eight, drawn four and lost six games this season. The Bluebirds have only lost two games at home in the league. Chippenham's last game was at home on Tuesday to St Albans City where they won 4-0. Ross Stern's cross found former Spitfire Toby Osman to volley in his second goal in two games to open up the scoring. Stern then scored his first ever goal for Chippenham, which saw the Bluebirds double their lead. Lewis Powell hit the back of the net for the first time this season and managed a brace on the night. The last time Chippenham played in the FA Trophy was away to Evo-Stik Southern League Division One South and West outfit Mangotsfield United after a replay was required in a 1-1 draw at Hardenhuish Park. 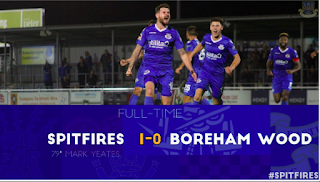 Aaron Wilson opened the scoring with a twenty-yard strike on goal and Toby Osman doubled the lead for Chippenham which saw them draw the Spitfires in the next round. Eastleigh's last game in the FA Trophy was one to forget as the Spitfires played Evo-Stick Northern Premier League side Chasetown in the third round in the 2010/11 campaign. Richard Davies opened the scoring when he took the ball past Eastleigh goalkeeper Jason Matthews (now at Bath City) and finished neatly to put the Scholars 0-1 up. Shaun McAuley (now at Basingstoke Town) produced a pinpoint cross that found Jamie Slabber who headed in a powerful finish. Chasetown then grabbed the lead again when Jamie Slabber was unfortunate to get the last touch and score an own goal. 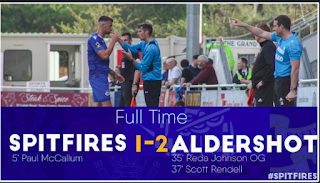 Ben Jevons finished Eastleigh off with a clinical finish after beating the offside trap and the game had just enough time for Luke Byles to get a straight red card, which ended the Spitfires' hopes of a Quarter Final and £7,000 prize money. This is going to be a great cup tie to watch, so roar on those Spitfires at Hardenhuish Park on Saturday to the first round of the FA Trophy.